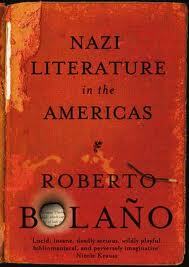 Nazi Literature in the Americas is not Roberto Bolano’s most famous or admired novel, but it seemed the ideal place to continue my efforts to read only what it is unusual and challenging. The book takes the form of an encyclopaedia of writers from the Americas, all of whom have fascist political leanings. Each writer is covered in a biographical entry of between two and twenty pages, focusing mainly on their literary output. In doing this, Bolano highlights perhaps more starkly than anywhere else the two obsessions which run through all his work: literature and politics. Here the title itself arrests our attention: surely ‘Nazi literature’ is an oxymoron? However, it does not take long to think of real (and American) writers who have been influenced by fascism. And anyway, Bolano has said that in writing the book he was thinking about the left as much as the right. Bolano is not positing the theory that all writing is political, he is pointing out that many writers are, and that being writers does not automatically put them on the side of the angels. So what do we learn from reading the thirty biographies (and the appendix of secondary figures, publishers and books)? We learn that writers can be as unpleasant and petty as anyone else; that their lives can be tawdry and empty; and that their work often comes second to the need for publication and recognition. While Bolano frequently presents a realistic view of the writer’s life and writers in his work, rarely has it seemed so unappealing. However, these are not writers united in political belief. All are right wing to some degree (and sometimes to an extreme degree) but many seem politically immature or opportunist and Hitler, Nazism, Jews are not frequently mentioned. When they are – one writer treasures a photograph of Hitler holding her as a baby – the connection is not always entirely political. Part of the effectiveness of this voice is its contrast with what has come before, as if the writer has broken free of his own rules. Going further, Bolano himself appears in the story, helping a detective track Hoffmann down. Bolano’s appearance (common in his work) is not a literary trick but a link between the lives he has described and his own. Presumably Bolano had some idea that this particular fictitious writer stood out among all the others, not only from his refusal to neuter his story by adapting it to the encyclopaedia format, but also from his decision to develop it further into the novella Distant Star. Unfortunately this means that Distant Star is a much better place to begun reading Bolano. Danger rating: A bit like reading the obituaries – amusing and tedious by turns, but the final chapter has the power of suddenly coming across your own. This collection of metaphors is a good example of the way Bolano resists schematic symbolism and instead achieves something more impressionistic. The turmoil in the continent is again apparent when Arturo Belano, another of those characters who seem to represent a facet of Bolano, decides in 1973 to return to Chile to take part in the revolution. When Arturo returns to Mexico he is a changed man, no longer “a shy seventeen-year-old who wrote poems and plays and couldn’t hold his liquor.” On behalf of a friend he confronts a local gangster, rescuing a young man in the process. However, for the most part the heroism of the novel is the heroism of writers, continuing to write in the face of not only oppression, but poverty and obscurity. Auxilio calls herself more than once the “mother of Mexican poetry”, a reference both to her maternal relationship with the younger generation of writers and also a hint at the link between that poetry and the oppression she has witnessed. This link is not an obvious one – these poets do not write protest poems – it is the opposition of violence with aesthetics. We have a glimpse of this when Auxilio’s vision of the future is a list of dates relating to when writers will be read, forgotten or reincarnated. Even art is not the answer, however. Belano leaves Mexico for Europe and instead we are left with the artist Coffeen Serpas, a recluse, who draws “thin and sickly-looking” figures which his mother hawks around the bars. They are “walking unstoppably toward the abyss”, singing. They are simultaneously the massacred students of Tlatlelolco, the young poets she has mothered, and the “prettiest children of Latin America.” A novel, which at times has seemed to meander, has come to a powerful and moving conclusion. You are currently browsing the archives for the Roberto Bolano category.